Most travellers to these islands crowd on and off the speeding hydrofoils that ply these waters, dragging their luggage along the crowded jetties while searching for their accommodation for the night. You will cruise in stately splendour, watching with a glass or a book in hand as the islands pass slowly by; swimming in the beautiful clear waters of a succession of gorgeous coves and bays, while your ever-attentive crew prepare the table for a delicious meal. To view these islands in this way is to partake in the very best that they have to offer, day after perfect day. Day 1: Your gulet awaits you in the port of Milazzo on the North-East coast of Sicily, 1 hour and 40 minutes’ drive from Catania airport. Welcome drink and dinner on board. Day 2: Your day begins with a lovely morning cruise to a beautiful bay on the coast of Lipari, for a first swim in the Mediterranean and a delicious lunch served at anchor. The stunning island vistas unfold across the wide horizon as we cruise across to the island of Filicudi in the afternoon. After dropping anchor in the tiny harbour, we will disembark and walk along the quiet lanes to the Bronze Age village at Capo Graziano set in a stunning location with magnificent views. Here we discover the story of the early inhabitants of the island and explore their millennia old settlement before returning for sunset drinks and dinner aboard our gulet. Day 3: The famously hedonistic island of Panarea beckons us today, at the end of a glorious long cruise eastwards through the island chain. A relaxing swim and lunch on board will be followed by a leisurely stroll along the flower-lined paths that lead from the small island port to the strikingly-located archaeological site at Capo Milazzese. After exploring the ruins, you could enjoy another swim, or perhaps sample one of the famous Sicilian granitas, or taste a perfectly chilled glass of wine, before preparing to step ashore again for dinner at one of the renowned local restaurants. Day 4: A short cruise brings us to the lovely islet of Basiluzzo, for a restful morning of swimming, reading, sunbathing and exploring the unexpected Roman heritage of this isolated spot. After lunch, the stark but fertile island of Stromboli is our final destination for the day. An active volcano spearing steeply out of the sea, its smoking summit will have been visible for much of our voyage so far. Its infamous lava flows are now intermittent, and many walking paths have been forged on its flanks. For those who wish, it will be possible to join our hiking guide to experience this volcano first-hand; anyone who prefers a more sedate afternoon is welcome to enjoy the views from the deck of the gulet instead! 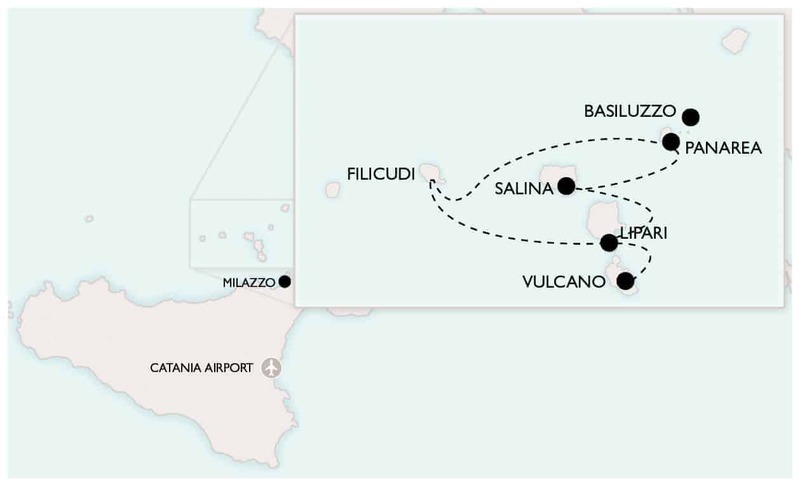 Day 5: Salina, the verdant island at the northernmost tip of the central spine of the archipelago, is the famed producer of some of the most charismatic wines in Italy. We will visit one of the innovative new wineries on the island, before sampling their wares over a sumptuous lunch at one of the region’s finest restaurants. A visit to the charmingly presented Museum of Emigration brings our historical journey right up to the early 20th century. Day 6: We cruise to Lipari, largest of the Aeolian Islands, stopping to enjoy a long swim on the way. After stepping ashore in the bustling harbour town, we will visit the astoundingly rich archaeological museum on the fortified headland overlooking the two harbours. After exploring its collections, there will be plenty of time to stroll through the streets, admiring the local architecture and browsing through the shops, before we head up into the hills to visit a spectacular new winery overlooking the straight between Lipari and Salina. A light meal will be served in the vineyard, accompany our wine tasting, as the sun sets over the archipelago. Day 7: A day of pure leisure and relaxation, filled with swimming, sunbathing, delicious food and chilled wine as we take a leisurely cruise back to the mainland port of Milazzo, stopping off at Vulcano, the final island of our cruise, on the way. Day 8: Transfer to Catania airport, about 1 hour and 40 minutes away. Our transfer vehicle will collect from Catania Airport at 16.00 should you wish your arrival at the gulet to be organised by us. If you prefer to arrange your own arrival, we recommend you arrive at the gulet in Milazzo (approx 1 hr 40 minutes from Catania airport) after 17.30. You are more than welcome to arrive earlier to drop off your bags, but please be aware that the crew will be busy cleaning and tidying making everything ready for you and you may not be able to settle into your cabin. Disembarkation is at 09:00 from Milazzo. We will arrange a transfer at 09:00 from the gulet to Catania Airport.